Messi "Argentina Can't Stay Out of the World Cup"
Lionel Messi is one of the most accomplished young football players in La Liga history. Last season was of course Messi’s miraculous treble winning year and the forward was awarded both the UEFA Footballer and Forward of the Year Awards for achieving the most goals of any player in the world in the UEFA Champions League tournament. Messi led Barcelona to the final and put it away with a brilliant second half header into the net over Manchester United. At twenty-two years of age, Messi has won three La Liga titles, two UEFA Champions League titles, and already has experience as an consistent goal scorer in the last World Cup in Germany as a then eighteen year old. Looking over this guy’s resume you can easily say that nobody is saying Messi is at fault for Argentina’s recent woes. Argentina is currently in fifth place right now in their World Cup South America group bracket, but the dominating squad from last Cup has not impressed in recent matches including two straight losses. And Messi is obviously not pleased that his squad is currently on the bubble and have not yet clinched a World Cup birth (much like Portugal and France in the European bracket). 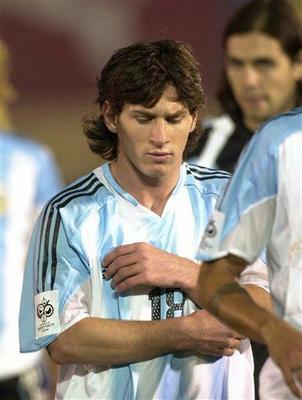 We have to get together and go forward because Argentina can’t stay out of the World Cup. I alone won’t win a match…this is down to all of us who are in the team. Truer words have never been spoken. The burden should be on the entire team and not just a twenty-two year old’s shoulders. But when your Lionel Messi such miracles are simply expected.